Between the parties, city-wide festivals, and pop-up events, Philly always goes all out for the holiday season. But this year, Chase is helping bring even more good cheer to the city of brotherly love. From perks at the Franklin Square Holiday Festival to celebrating NYE all month at Capriccio Cafe, they’re bringing out the best of the holidays for Philadelphians this December. Why? It’s all to celebrate JP Morgan Chase expanding into the Greater Philly area, with 50 branches set to open over the next five years. So take a gander at what they have going on this month, and make some room on your calendar. 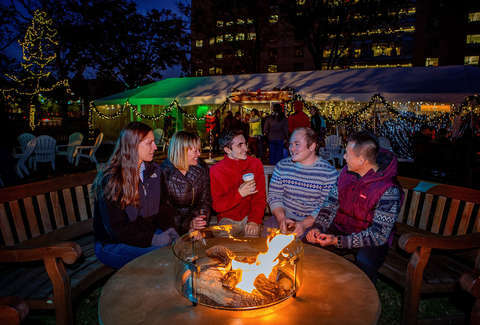 Few things say “holiday magic” like 75,000 twinkle lights -- except maybe a winter beer garden with local brews with cozy fire pits. Lucky for you, the Franklin Square Holiday Festival presented by Chase has both. (Not to mention festive train rides and plenty of kids-friendly Santa activities, too.) Guests of the festival also get a ton of discounts at the festival each evening. Show up between 5:30 and 7:30pm and you’ll get $2 off a ride on the Parx Liberty Carousel, Philly Mini Golf, and a gourmet hot chocolate (or any food and beverage purchase, like donuts fresh out of the hopper, peppermint tea, eggnog, or homemade fudge...) at Ben’s Sweets and Treats. There’s even a s’mores bar, where you can roast your own marshmallows. Save a few bucks on all those activities, then stick around for the Electrical Spectacle Holiday Light Show presented by PECO, which celebrates Philly’s most beloved resident, Ben Franklin. (Oh, did you think we were going to say Gritty?) Shows are free and take place from 4:30pm to 8pm nightly, through New Years Eve. The best holiday gifts are the ones that are super personal and thoughtful, so it’s no surprise that to the city of Philadelphia, Chase is gifting a sports viewing party this December 9. If you’re a hockey fan, head to Tradesman’s on Chestnut Street from 1pm to 6pm December 9 to catch all the games, plus giveaways and discounts throughout the party. You can’t forget about the biggest party of the year, and Chase is making sure we’re ringing in 2019 in Philly throughout December -- and getting us motivated to keep those New Year’s Resolutions. Resolutions, presented by Chase, is a pop-up, NYE-themed bar taking over Capriccio Cafe in Cret Park daily, with seasonal wintry cocktails from Tito’s Handmade Vodka, wine, and Sam Adams beer, plus weekly happy hour specials and deals too. There will even be Quizzo, Barefoot Wine & Bubbly tastings, and a Mummer’s performance -- because it wouldn’t be New Years in Philly without one. Settle in for a bit with your cocktail, then, set your resolution in stone on an Orangetheory Fitness #goals wall… just to keep yourself honest. Thanks to Chase, we’ll be celebrating right all month long.